This is a linked series of adventures, set in a remote mountain township called Pembrooktonshire. It's introduced briefly here before the adventure text proper, but also features in a complete supplement available wherever you obtain this work. In particular, the GM should note the insular nature of the citizens, as this becomes relevant during the course of the adventures. Although linked, the adventures should be run according to what the characters choose to do, where they decide to go whilst in town. However, 'Small Town Murder' ought to be run before 'The Great Games' (if you use it at all), and 'A Lonely House on a Lonely Hill' is appropriate at any time that they choose to go into the mountains. The Last Stop is one of the first buildings encountered on arrival, and it's the main inn - a likely place for adventurers to visit on their arrival in town. Note that you (or they) need to find reasons for why the characters are there, none are suggested. If you choose to run 'Small Town Murder' this is where the characters will first hear of the sad events that occurred just the night before, a wedding turned to tragedy by the murder of the bride. The apparent culprits have already been apprehended with the help of a visiting 'Knight of Science' (a kind of paragon of virtue and fighter against unnatural evils), so it will be up to the characters whether or not they wish to investigate further. Should they do so, interaction and intrigue rather than brawling is more likely to yield results. The second adventure, 'The Great Games,' involves a town festival of perilous sports, from which an individual is chosen to be sacrificed up in the mountains. Given that the locals don't like interference in their affairs - and particularly not in something as important as this - any characters wanting to intervene will have to be very careful indeed. However, if they do express reservations about the proceedings, adventure is to be had... perhaps too much adventure, there's the real possibility of starting a war! The final adventure expands on what is to be found up in the mountains, and presents a more conventional challenge to adventurers. There are also a few notes giving ideas for further development should the characters wish to stay in the area. Overall, these are coherent and original adventures, which belie the 'old school' tag by going well beyond any thought of adventure being simply fighting monsters, exploring dungeons and stealing loot. There is plenty of scope for interaction and characters will have to exercise their brains as much as their sword-arms if they wish to succeed. 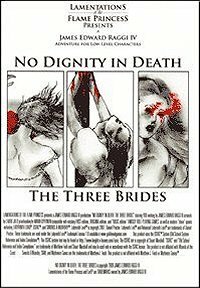 Return to No Dignity in Death: The Three Brides page.